Today marks what would have been Ayrton Senna's 58th birthday. 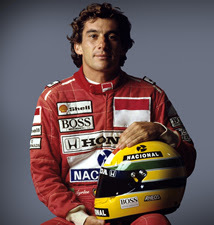 The Brazilian three time world champion in Formula 1 racing unfortunately passed away in a race at Imola Italy in 1994. While there is always a debate in any sport about who is the Greatest Of All Time (now known as GOAT), Ayrton may not have won as many titles as Michael Schumacher and a few other drivers, he's my favorite. If you're not familiar with the story of Senna's racing career, you might want to check out some video clips from his career. Take your choice of many highlights, such as his record number of wins at Monaco, his years at Lotus and McLaren, or his first year with Toleman and final shortened season in a Williams. One quick highlight would be the 1993 European Grand Prix at Donnington in England, where in a pouring rain, he moved up from 4th on the grid and into 1st place on the first lap! Besides his ability to drive in the wet in this race, let's take a look at WHO he passed. Lined up ahead of Senna were Alain Prost in 1st, a 4 time world champion. In 2nd on the grid, Damon Hill, who would go on to win 1 world championship. Also ahead of Senna was a guy named Michael Schumacher, who would end up with 7 titles. In other words, thanks to both the wet slippery conditions and his outstanding driving skill and determination to always win, Senna was able to pass 12 world championships worth of drivers in a single lap in terrible conditions. That alone makes this lap one of the most famous in racing, but if you dig a little and read about the rest of this one race, it makes a great story too, with the changing track conditions (wet or drying) resulting in as many as 7 pit stops for some of the drivers. I think this was the race where the fastest lap was set by Senna on a lap where he came into the pits! At that time there was no speed limit on pit lane, and after coming in to change tires he had a change of mind and accelerated through without stopping, setting fastest lap along the way!